Deloro Stellite is a global manufacturer of solutions to industrial wear problems, where heat, corrosion and abrasion can limit component life. It produces proprietary metal alloys from cobalt and nickel, which have metallurgical and physical properties suited to industrial wear challenges. At its coatings operations, sieving was a critical process since the size of powdered metals controls its flowability into customers' weld points in a range of applications. 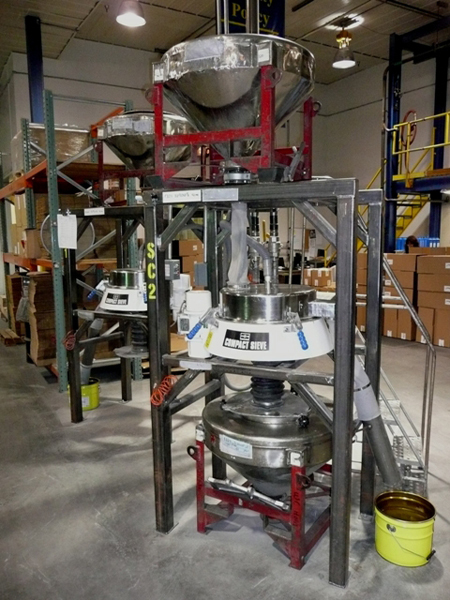 To streamline production and enhance quality, the company sought a new sieving process for all initial powder inputs and final powder products at its Indiana, U.S.A plant. While the company used traditional sieves for lower volume powder classifying, Bob Minton, maintenance manager, felt traditional machines were too slow and complex for Deloro Stellite's metal powder screening requirements. "With 5,000 product variations, we'd have to take apart each sieve, clean it and put it back together 10 to 12 times a day," explains Minton. "We needed a sieving technology that was easier to use than the same old type that's been on the market for 40 years." The traditional sieves were cumbersome to work on, take apart, clean and put back together. And if the seals weren't aligned properly, they could leak, potentially ruining a product batch. "Band clamps wore out, bent, broke or cracked, and the seal had to line up all the way around the flange," says Minton. "It took two people to work the seal around large diameter units, with no alignment pins or guides." Fine powder sometimes worked its way into the clamp bolt threads on these traditional sieves too. When this happened, the sieve operators would call maintenance to have the bolt cut off and replaced with a new one. Maintenance was also called whenever sieve vibration adjustments were needed, leading to further production downtime. In search of a solution, Minton turned to a Russell Compact Sieve. The unit's design and ease of use impressed Minton, who felt it would expedite product changeover and improve bulk metal powder processing. "One operator can take apart and put together a Compact Sieve in less than a minute with no tools," says Minton. "Just undo four latches by hand, lift the top off, and then lift the screen out. It seals perfectly. There's no chance of misalignment, and cleaning is easy with a vacuum line." Minton estimates the new sieve technology saves about an hour a day in production downtime, compared to the cumbersome product changeover process required by traditional sieves. Product output and quality are also improved by the new Russell sieves. Traditional designs incorporate a spring-mounted base and a custom motor with a pair of eccentric weights at the end of the motor shaft. However, this design lacks accuracy in controlling the force of vibration imparted to the mesh screen, and is typically limited to a speed of 1200 rpm. In contrast, the Compact Sieves from Russell Finex omit the need for springs and instead uses a patented rubber suspension system. "The adjustable weight system makes it easy to set the machines up," says Minton. "It helps us get the right time on the screens to get every bit of powder possible, while minimizing product loss to oversize." The design of these vibratory screeners can go a step further to increase throughput by using the Russell Vibrasonic deblinding system in conjunction with the screen. By energizing the wires of the screen mesh with an ultrasonic vibration, the friction between the product and the screen is effectively removed. In the case of the Russell Finex machines, mesh “blinding” is eliminated, helping to move material through the screens faster. "We cut downtime from product changeover by a third and enhanced product quality by switching to the Russell Finex Compact Sieve," says Minton. "By expediting cleaning, preventing cross contamination and aiding product quality, we achieved ROI in a few months." Contact Russell Finex to discuss your metallurgy screening requirements, or try the online Interactive Application Finder today.